My brain hurt from trying to understand what I'd just seen. More than a dozen shipping containers had just vanished right in front of my scales. Beside me, Aleetha and Tank look on, wide-eyed and speechless. Hilsa leaned on his staff, looking exhausted but satisfied. If casting the spell had tired Hilsa, it had completely knocked out the mysterious monster under the black cloak. As the pair of kobolds dragged the figure away, a thin tail not unlike my own poked out from under the cloak. I looked quickly to see if Tank had noticed, but she was still too busy trying to wrap her brain around the vanishing containers. "You just used magic and technology together!" my friend gasped. "Not impossible, little wizard." Hilsa's words came slowly, like he was trying to catch his breath. "It just requires a little creative thinking." The wave mage looked at Stitch. "You were correct about our stowaways, Captain. They are of little interest to our mission." Captain stitch glared at us with his one good eye. "Then let's get rid of them." 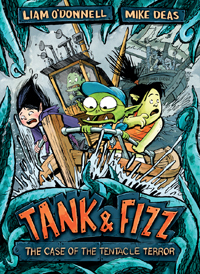 The monster-detective duo of Tank (a troll) and Fizz (a goblin) are back with another mystery on their hands. This time Tank's mother is in danger of losing her job as harbour master because two ships carrying cargo for the giant industrial company SlurpCo have vanished from their moorings, apparently engulfed by a cloud of black mist rising from the water of the harbour. The crews of the ships were not harmed but were discovered unconscious on the shore, remembering nothing of what had happened or how they got there. Detective Hordish, police detective and ogre, reluctantly acknowledges that, since he has been helped by the pair of fourth graders several times in the past, he will allow them to be present as he plans a stakeout on the third of SlurpCo's ships. Instead of being just observers, however, the two, plus a friend, get "disappeared" along with the ship and its cargo. The agent of their removal from the harbour was, apparently, a giant octopus-like creature with some sort of electrodes attached to its tentacles! Adventure follows adventure, including a bit of time spent -- horrors! -- outside the friendly dark tunnels of Rockfall Mountain. Sunshine! How dreadful! It is not surprising that this series, of which Tank and Fizz: The Case of the Tentacle Terror is the fifth, is a hit with early-novel readers. It has everything: excitement, suspense, inter-species friendships (apparently there is no racism in Slick City), and a whole lot of yuckiness. Not just green skins, googly eyes, and fangs, but choco-slug cookies, dulce-and-yarrot soup, and dog-headed kobold pirates. It also has lots and lots of tech and computer gadgetry that mixes in with magic to provide new and different effects. When all these individual pluses are put into a half-way plausible story presented in a mix of pictures, comic strips, and regular text, what you get is a real winner. What's not to like, as they say? I suspect we shall be seeing more of these little monsters. Mary Thomas is a retired library person who lives some of the year in Winnipeg, Manitoba, and is gradually being won over to a grudging appreciation of graphic novels and their uses.